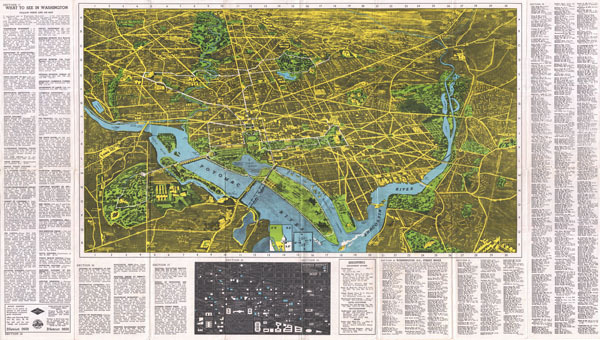 1938 Pictorial Map of Washington D.C. This is a highly detailed and very interesting 1938 pictorial guide map to Washington D.C. The 'Washington D.C. In and Out' map features a birds-eye view of the city with streets, various monuments, parks, and neighborhoods labeled. Surrounding the map are notes on 'what to see in Washington.' On the left-hand side of the map there is a list of landmarks and museums of interest, each with a brief description and address. On the right-hand side is an in-depth city street index. The guide even offers a walking tour of Washington, urging you to 'follow the white line' on the map from point to point. A smaller map of the business district is featured in the lower part of the map. The verso offers a wealth of practical information for the tourist. Each section is dedicated to educating the visitor about Washington D.C. Section 1, for instance, is titled 'The Story of Washington' and offers a brief history of the city. Section 5 is full of information on local hotels, while section 13 lists sites of interest outside the city limits. The guide also recommends restaurants, auto repair shops, camps, inns and numerous other places or shops a tourist might find helpful. The guide was published by the Washington D.C. News Company in 1938. Very good condition. Minor wear on original fold lines.